A lot of cars have been involved in accidents due to the brakes failing, to avoid your brakes failing you need to make sure that the brakes on your own vehicle are in prime working condition. If you are not aware on how to look after your brakes, you might be relieved to know that the car brakes are most probably the most important and easiest to take care of. Even the car drivers who only have a little knowledge about the mechanical aspect of a car can easily detect if the brakes are safe by simply following some simple guidelines. However, we are not suggesting that you move on to repairing or replacing car brakes, as you should not, only a qualified and skilled mechanic could ensure this is correctly done. What this article is trying to provide are four signs that would suggest that it is time to consider car brake repair. If you are hearing a high-pitched squeal each time you apply the brakes, this suggestes that you should swiftly repair the cars brakes by taking it to a skilled car mechanic. The squeal means that metal to metal contact is now occurring, this is due to wear and tear and the worn out condition of the brake pads. If you notice that your car is taking a while after you have applied the brakes or even worse fails to stop, you should visit your mechanic without delay. It is not only dangerous to continue driving, it may also put yourself at high risk of being involved in an accident. If the steering wheel jolts in your hands as you come to a stop, this might mean that there is something wrong with the brake disks. The brake discs can become warped and can become deformed over time, however 'jolting' is an indication that you need to get this inspected immediately. Should you ever see smoke coming from your wheels after the vehicle has stopped, this is a strong indication that your brakes are in need of immediate mechanical attention. As mentioned earlier, you must never attempt to repair car brakes yourself hoping that by chance you will be able to enhance your car's brake system. Only a qualified car mechanic can ensure that the proper service procedures are carried out for the safety of your car including its passengers and including you the driver. Additionally, only a skilled car mechanic can ensure that the appropriate parts are installed for your car especially when your car is new, since modern cars have highly complex braking systems and only a brake specialist are allowed to fix and adjust brakes. So please do not attempt to mess with your own car in order to prevent untoward consequences later on. 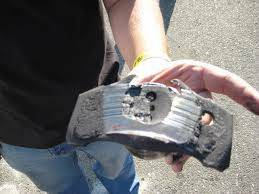 In a nutshell, you should not delay when it comes for the need to repair car brakes. You need to remind yourself that your safety and the safety of others on the road is in danger when your brakes are faulty.